Any artistic career has its vanities. One area at least in which I thought myself the British pioneer was the artist's book. This is now a genre in its own right taught earnestly in colleges here and abroad. The particular variant I was certain had been my own discovery was that of working over a complete novel (W.H. Mallock's A Human Document) to make what I call a treated book. Alas a recent fragment of information gleaned, as is most of what I know, from the pages of the TLS, challenges my claim on all counts. Among the books once belonging to Oscar Wilde held in the Library of Magdalen College, Oxford, is a copy of Mallock's A New Republic of which page 30 displays a graphic intervention in the form of 'a jam stain', perhaps the first mark of a projected treatment by Wilde of the whole volume. I thus find myself neither the inventor of the process nor the first Oxford graduate to employ it. More pathetically I am not, it would seem, even the first to have used a text by W.H. Mallock. Distressed I rang Magdalen's librarian who obligingly took down the book and reported that it was a 'spot' rather than a 'stain', and not identifiably 'jam' (chemical analysis is promised). In effect this was merely a typical example of the lurid sensationalism that gives the TLS a bad name. Nonetheless I had lost my claim to originality and was reminded of the story of an evening at the Cafe Royal when Whistler coined a specially clever epigram. "I wish I had said that" remarked Wilde, at which Whistler rejoined, "You will, Oscar, you will." 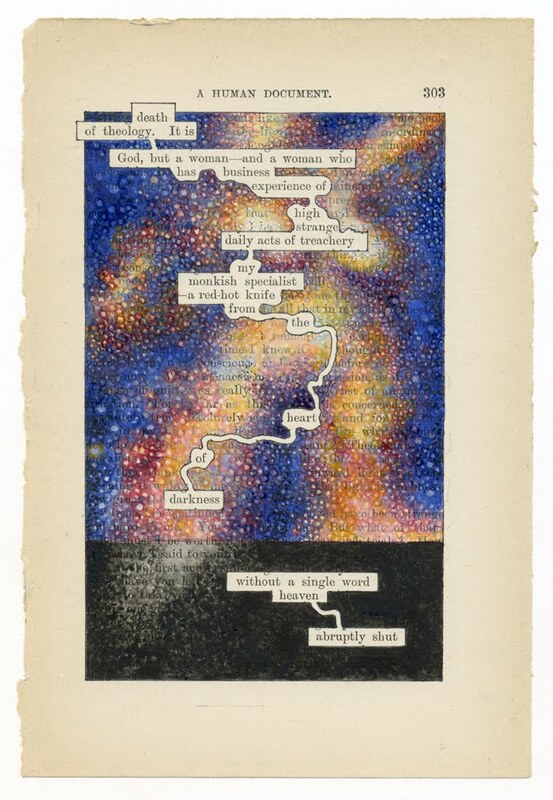 Undeterred by the blow I carry on with my revisions of A Humument. It is a good recipe for an artist to persist with a task, to head for the often drawn mountain, to set up the familiar still life: return to the same spot and dig a little deeper. 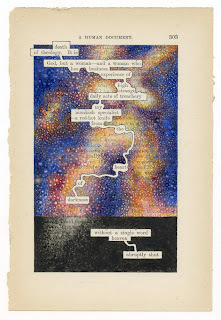 A Humument page 303, watercolour, 2010. Prof. COLLINS: One of the other ones that we have here has, I'm pretty certain, a strawberry jam stain. Samuel Johnson, actually, his first folio, is full of food stains. The next owner that had it after him said, I've repeatedly met with thin flakes of pie crust between its pages. Thank you anonymous for your uncrusty mention of Johnson. Treating a book is one thing,but actually feeding it was well ahead of the game. the 250th anniversary of the great dictionary. it was my largest edition of anything [18,000,000]. my admiration, dear sir. I have several pages hung on my wall. "my monkish specialist -- a red-hot knife from the heart of darkness" -- love it, positively Dan Brown. This luminous lady (last seen stepping from a tiled shower on page 142, 2009) seems to be gaining weight, physically & metaphorically. Love her, too. My favourite of all the 50p reverses, though run close by the 2009 Kew Gardens pagoda. 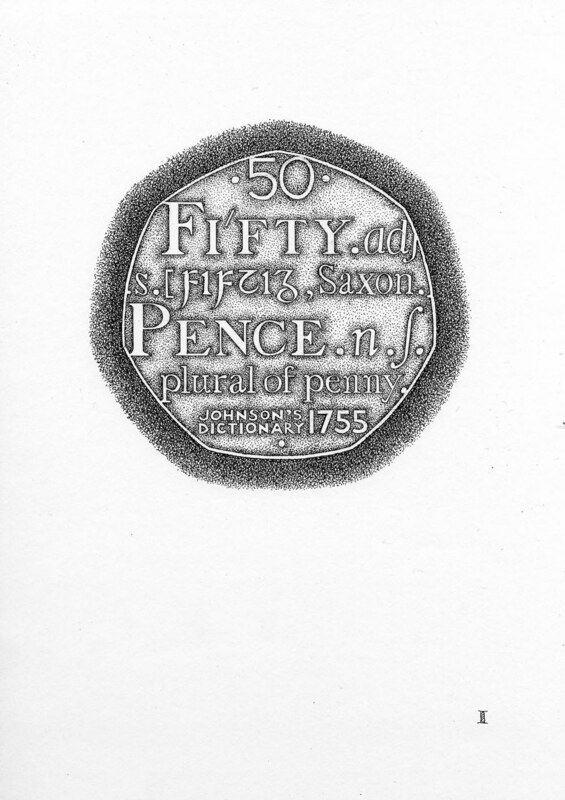 As Mike C knows (because I told him recently), my ex-brother in law designed the obverse. Incidentally, Wikipedia says there are 17.6 million in circulation: have you got 400,000 stuffed down the back of your sofa?